"Some Pictures of the ice cave and one from the volcano. From the first week of January 2006. Taken by myself: Candy Rudolf, Corpus Christi, Texas. Enjoy, It was a wonderful experience." "I took the attached photos today of your hummingbirds coming to the feeder in front of the visitors center. Please consider these my entries to your 2007 photo contest. My family and I enjoyed our visit today. We've also been to the ice caves in Shoshone, Idaho." "Here are a few photos from our visit to the Ice Cave on July 27, 2006." "Attached are some photos of our trip to the Ice Caves on March 27, 2006. We all enjoyed our visit. Thank you for doing this photo contest and posting of the pictures in your photo gallery. " "I was out there the first of August and told you I would send you some pictures by Dad and Mother took when they were sawmilling out there in the mid 1930's. The group picture, with the man neeling in front, was taken after a trip to the ice caves. You will notice several of the people are holding ice or containers of ice. The man on the right is my father, Clarence Vaughn, the couple on the left is my father's brother and his wife, Floyd and Thelma Vaughn, I cannot identify the rest, but I believe the man neeling in front is the sawmill owner a Mr. Brundage, but I am not sure. On the back of this picture is written "Ice from the ice caves for tea". The group setting on the logs at the mill is the whole sawmill crew, My father is on the left and my uncle is the third from right. The house was located in Paxton Springs and was where the saw mill crew ate their meals. I don't believe the big log house still standing at Paxton Springs was there back in the 1930's. The ladder leaning up against the back of the house was used to get down into the ice caves. I am also sending a picture of the row of log cabins at Paxton Springs taken in 1959 when me and my father made a trip out there. The second cabin from the front is where by mother and father lived." "Thank you for your kindness in offering to hold Flat Stanley so we could take his picture with you. I remembered that you said you had read all of Flat Stanley books to your Nephew so thought you would like a copy of a few of the pictures we took of Flat Stanley at the Ice Caves the 1st of November. We put a neat little book together using all the pictures we took along the way from Oklahoma to Arizona and back again and sent it to our grandsons school (Legacy Christian Academy in Frisco Texas) for all to read. We are sending a copy of the page we included in the book about the Ice Cave." "I took the attached picture on Sunday Oct. 31, 2004 during our visit to the land of Fire and Ice. Looking at the tree you can clearly see the track where the treebark is missing on the left side of the trunk starting almost at the top down to the bottom created by lightning." "The ice caves and volcano visit is one of the favorite memories of our visit to New Mexico." Last weekend week my wife left to chaperone a high school trip out of state. This included my two eldest children, and left Zachary and me home alone. Instead of just sitting around all day, We'll a search for a good day trip destination from Albuquerque. We ended up picking the Ice Caves, southwest of Grants New Mexico, within the El Malpais National Monument Area at an elevation of 8,000 feet.. The trip will include a short stretch of mountain curve driving on high-way 53 to test this baby out. So Saturday morning Zachary and I set off. The trip from Albuquerque goes through some Indian pueblos and some wide open spaces. The picture below is of an area I think is very picturesque. The hills are not rolling, but have shear faces. Unfortunately the pictures through the car windows and having the foreground in the shadow of a cloud do not do the area justice. So if you ever come to Albuquerque for the Albu-querque International Balloon Fiesta, the Ice Caves will make a nice afternoon outing. So on to the Ice Caves. When you arrive you park in front of the old trading post, where you can buy all sort of souvenirs. There are postcards, Indian arts and crafts, crystals, etc. There are two trails, the one to Bandera Volcano is to the right or northeast of the Trad-ing Post, the other left or south-west of the Trading Post leads to the Ice Cave. Pay the park fee at the Trading Post and get a guide. I highly suggest going to the Volcano first. In Grants we bought Subway sandwiches and left them in the Trading Post refrigerator for later. On the hike up the Bandera Volcano, off to the west, you can see several other volcanos in the dis-tance. 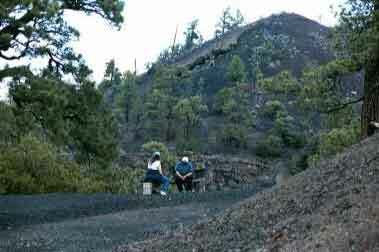 On the trip up to the top of the volcano there are several rest stops. The trip is about a half mile and only 150 feet vertical climb so those in hiking shape should not need them, but still the eleva-tion of 8000 feet might get to some. Even if you donÕt need the rest they make a nice place to sit and enjoy nature. 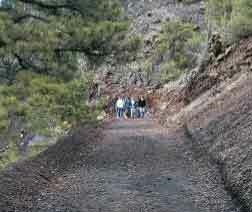 As you can see the trail is wide, smooth (crushed volcanic ash, I wonder where they got it), and a gentle grade. Along the trail many items of interest are marked with numbered logs and the guide gives a description. This is near the Crater Look Out Point. This picture is facing south, the lava broke through the north end of the volcano, then traveled along the west side of the volcano and then south. 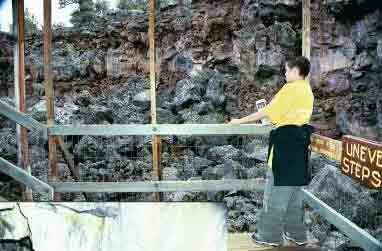 As the picture below shows the lava flow left a wide canyon, known as devil's playground. The area around the trading post contains several small log condos. They were used by the Zuni Mountain Railroad workers and log-gers I suppose. The old outhouses still stand and I believe are functional since they seem to be equipped with the essential roll and maga-zines. However, conventional bathrooms are in the trading post. 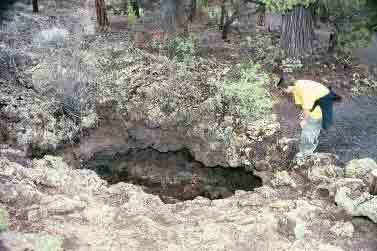 The trail to the Ice Cave has several sink holes where the lava tubes collapsed. they too are small Ice Caves. They were used as refrigerators to ice down the railroad worker's and the logger's beer kegs. The Ice Cave cavern is fairly large, even with a 28mm lens you can't get it all in. This is actually two pictures stitched together. The green stuff in the ice is artic algae, how it ever got here in the middle of New Mexico beats me, must have been from penguins migrating north for the summer. After visiting the Ice Cave you have to climb back up the stairs. Along the way green and orange moss have taken over the old volcanic rocks. After all the hiking a quiet lunch in the shade of the pines was nice time to relax before the trip home. "Honest Zachary, my school bus was just like this when I was a kid."